A part of heirlooms, often passed on as a family’s heritage, a grandfather clock is all about passionately preserving the family’s tradition. These floor clocks bring a different kind of aura to the home with their somewhat laid back, vintage-like style. 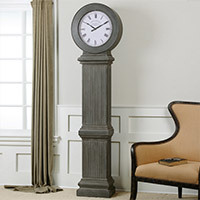 Our range of Grandfather Clocks makes an instant impression with their splendid craftsmanship, rejuvenating your living space with a style that will last forever. Standing tall in the living room, these picturesque floor clocks are a point of visual engagement. Built for years of usage, these are crafted from premium, resilient materials. You can find nearly every classic floor clock design on display here. Grandfather and Floor Clocks There are 2 products.